This post was originally published January 29, 2015. Hello, everyone! It’s time to play What’s Under Jill’s Kitchen Sink? So, some of you may remember that I was planning on cleaning out the cabinet under my kitchen sink. I know, I know, my life is wildly exciting and glamorous. Don’t be jealous. Well, I didn’t get around to it the day that I mentioned it, but I decided to tackle it after dinner tonight. I can honestly say that I haven’t really cleaned out from under the kitchen sink since we moved into the house 12 years ago. My husband, however, has cleaned it several times, as we have had some intermittent leaking pipe issues under there (so stop those gagging noises right now!). 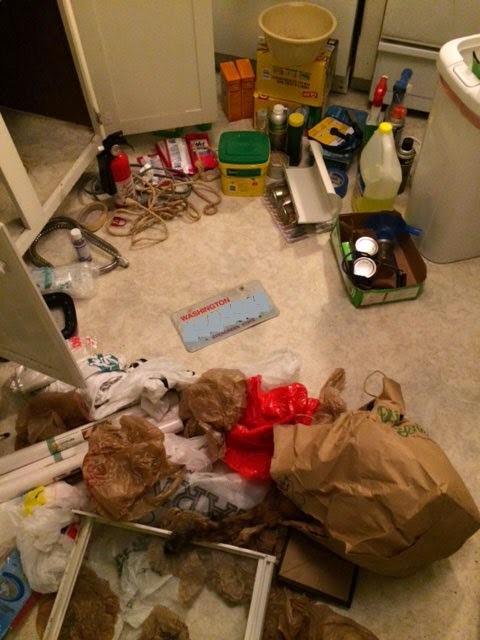 Still, over time, it has become a black hole filled with half-empty bottles of cleaners and insecticides, plastic bags, old flashlights, extension cords, and other things that I couldn’t even remember. This picture doesn’t do justice to the GIANT MESS THAT LIVES UNDER THE SINK. I pulled everything out into the floor, so that I could, you know, fully appreciate the mess. Yes, all that was under the sink. 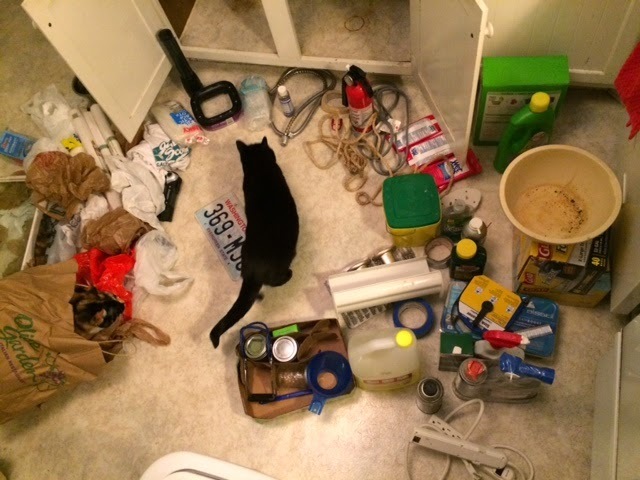 Here, Fifi investigates the GIANT MESS. I bagged up all the extra plastic grocery bags and took them out to the car immediately, so that we can recycle them next time we are at the grocery store. Here are some of the things that got tossed into the trash. I made sure the fire extinguisher was fully discharged. Not picture above in the “tossed” pile – the yucky glass refrigerator shelf. I considered donating it, but it was so rusty and gross – ick! I also recycled the plastic shelf. We’ve never used it, and honestly, I am not even sure how it fits in the fridge. Also, the license plate was disposed of properly according to Washington and Tennessee requirements. And I tossed all the expired wet wipes. Only two items were selected for donation (most stuff got tossed or recycled). I am keeping the canning stuff, but it was all quite dirty. 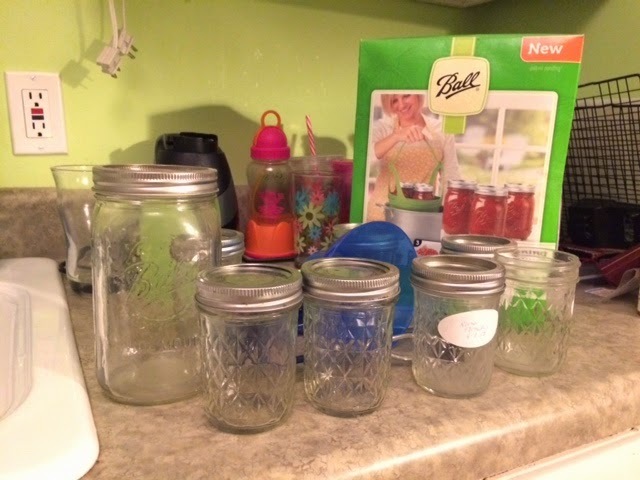 I had to toss some of the lids and rings, but I am running all the jars, funnels, etc. through the dishwasher. I don’t know if you can tell from the photo, but the woman on the box bears a strong resemblance to Amy Poehler. Here is the freshly scrubbed cabinet. 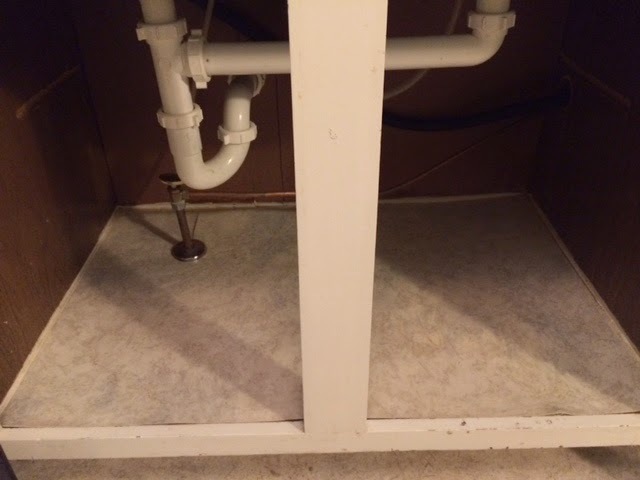 Notice how the previous home owners were kind enough to “floor” the bottom of the cabinet with vinyl flooring that matches the rest of the kitchen. And here is the final result! 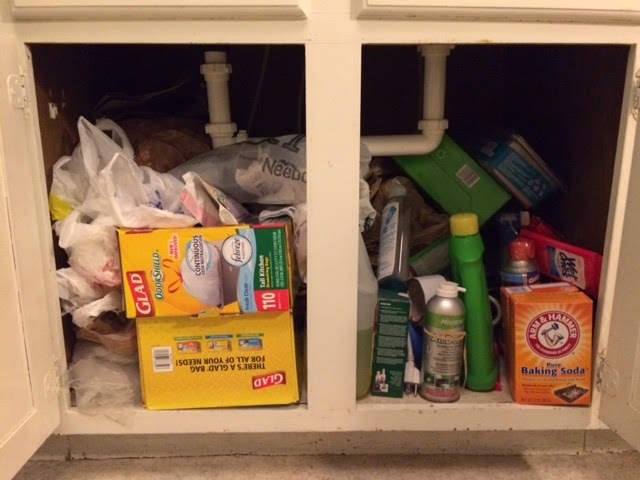 I returned the garbage bags, dishwasher detergent, baking soda, Mr. Clean, Swiffer pads, cleaning rags, and a few plastic bags to the cabinet (the plastic bags are neatly contained in the P.F. Chang’s bag. 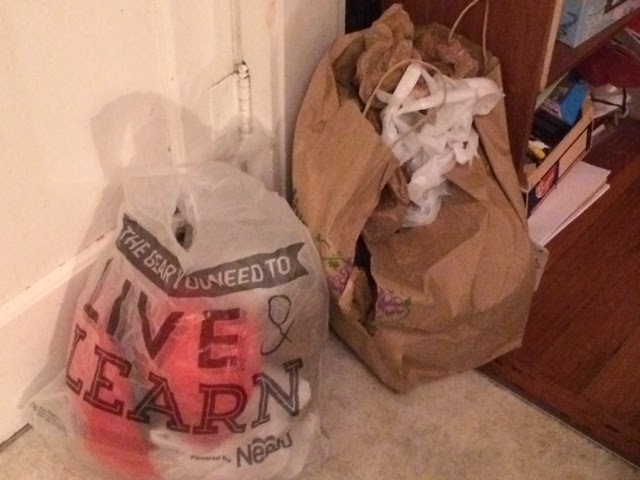 Yes, I know – plastic bags in paper bags – maybe that’s a thing in our house). There was enough room left in the freshly cleaned cabinet that I was able to store the kitty litter, puppy pads, and cat box liners under there as well! These were previously “stored” on the other side of the kitchen, where they total blocked access to a lower cabinet. 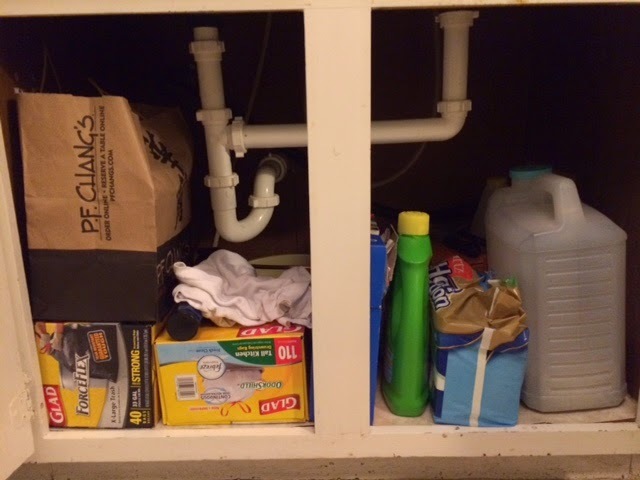 Upon completion of this project, I dragged my family into the kitchen to admire the beauty and elegance of the new sparkling clean under-sink cabinet. They were so impressed that they hoisted me on their shoulders and carried me around the kitchen nodded politely. Now your turn. Have you ever experienced inordinate satisfaction from a simple decluttering project? Please share in the comments area below. I know some people would have been interested in some of your “tossed in the trash” items. Do you have freecycle near you? Or have you tried the Craigslist free section? I’ll bet someone might have wanted some plant fertilizer or partial bottles of cleaners…if for nothing else than to refill the spray bottles. 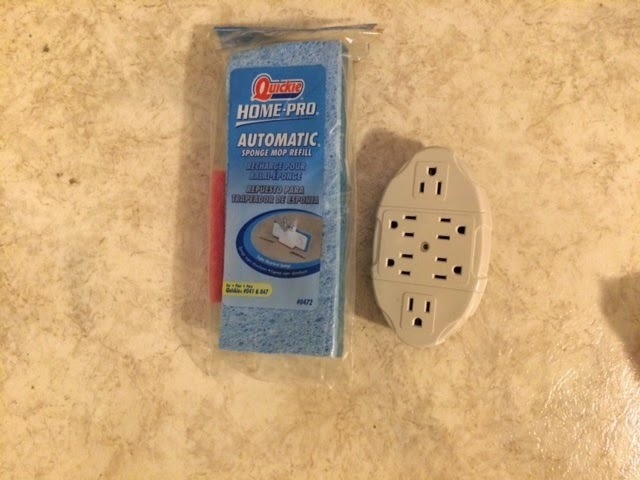 I find that the spray bottles from cleaning products last longer than the empty ones you can purchase in the store. 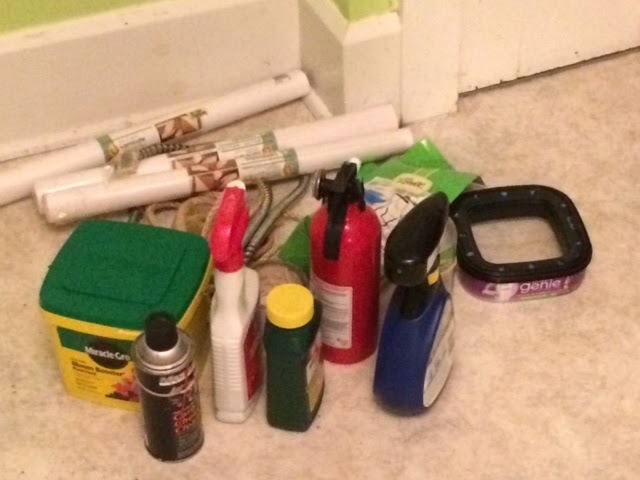 You are correct about the half-used cleaning supplies. We do have a Freecycle in our area, of which I frequently avail myself, and that would have been a better place to dispose of those than in the trash! Thank you for the suggestion! The plant fertilizer however had … um .. turned. At some point, I think it had gotten wet and, well, we’ll just say that I would feel uncomfortable having it anywhere near any of my plants!